Mailbox Detailed Like A Rustic, New England Church. A Mailbox that resembles a New England Church. Handcrafted by Colorado Artist Dan Barden, of WoodsandWatersArt, Littleton. Colorado. Built around a brand new US Mailbox, detailed as a rustic church. Roof is fiberglass over wood, textured to look like old time shingles. Windows are custom fiberglass with stained glass, and metal diamaond panes inbedded. 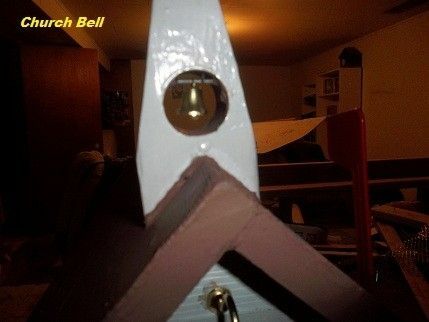 Steeple is fiberglass over wood, complete with brass bell that rings when box is opened. Dimensions: 24" long, 18" high to steeple top, 11" wide.